“I always look forward to a new album from Penny Weedon because her stylish orchestral arrangements are invariably full of warmth, feeling and musical expression. 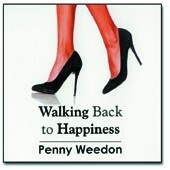 Her latest CD, ‘Walking Back To Happiness’ is no exception and, from the opening bars of the first track, it’s apparent that the Weedon magic is there. Never one to ‘big herself up’ we can easily forget what a talented all-round musician Penny is (although I am often reminded by the clever simplicity of her tutorials for the Yamaha Club magazine). None-theless, her thorough understanding of orchestration is self evident in many of the arrangements.